Eberhard Klemmstein commenced his muscial career in the Reger Quartet in which he was the violist for 11 years. With the Quartet, he gave world-wide performances and made radio, TV and record recordings. His renown bases equally on solo recitals and CDs as on international activities as a teacher. Since 1979, he is the Head of the Erlangen Music Institute. In 1985, he founded the Marteau Ensemble, a chamber music group which is dedicated to the interpretation of works for larger numbers of players. Since 1985, he has composed several works for the violin, chamber music pieces for larger groups, three operas and a number of lieds. 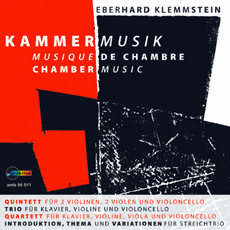 Subsequent to „Nouveautes“ (amb 96 814), a selection of compositions for the violin, the present CD brings a collection of chamber music works in various instrumental combinations by Eberhard Klemmstein. The string trio “Introduktion, Thema und Variationen” for violin, viola and cello is special delightful. Originally planned for a first performance in Mexico the entire piece is replete with Spanish and Latin American motives confronted with idioms from the late German Romanticism.